A LOAN agreement was signed today (March 29) in the city of Paramaribo between the Republic of Suriname and Kuwait Fund for Arab Economic Development, whereby Kuwait Fund will make a loan of KD 5 million (equivalent to about $17 million) to assist in financing the Expansion of Power Generation, Transmission and Distribution Networks Project. 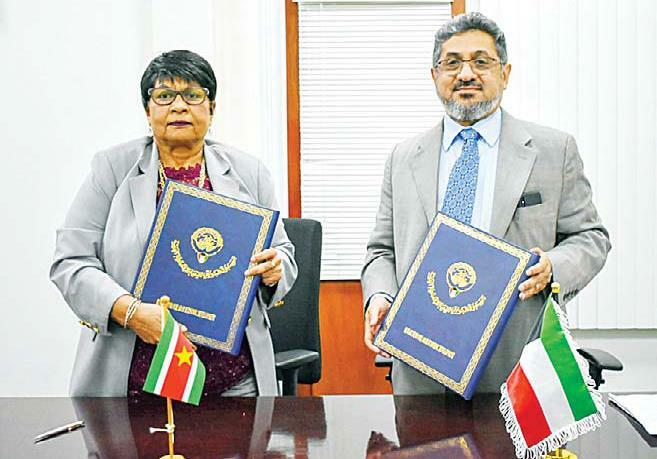 A Project Administration Agreement relating to the Project was also signed between the Suriname National Electricity Company (EBS) and Kuwait Fund. It is worth mentioning that the Fund is a Kuwaiti public corporation, which relies entirely on its own resources for making loans and providing other kinds of development assistance. Her Excellency Mrs Roline Samsoedien, the Acting Minister of Finance signed the Loan Agreement on behalf of the Republic of Suriname, while Marcel Eijindhoven Msc, Chief Technical Officer and Adnan Ismanto, Chief Financial Officer of Suriname National Electricity Company (EBS) signed the Project Agreement on behalf of the said Company. Marwan Al-Ghanem, Deputy Director-General for Operations of Kuwait Fund for Arab Economic Development signed both the Loan and Project Agreements on behalf of Kuwait Fund. The project aims at increasing the welfare and improving the living conditions of the population of Suriname and also improving the competitiveness of the domestic producers and exporters. This will be achieved by expanding and upgrading power generation, transmission and distribution of the power systems to meet growing demands for electricity. The project includes all necessary civil works, together with procurement, supply, and installation of electromechanical equipment to construct Paranam Power Station, and expansion and upgrading of the associated transmission network (Paranam Power System, EPAR). The project also includes all necessary civil works, together with procurement, supply, and installation of electromechanical equipment to expand the existing Clara Polder power station and expansion and upgrade of the associated transmission and distribution network (Nickerie power system, ENIC). In addition, the project will include the required consultancy services, environmental and social impact studies, project management and financial audit.